ScaleUp North Florida is an entrepreneurial growth program that is hosted by UNF and is fully funded by the U.S. Small Business Administration. We help entrepreneurs increase sales, hire additional people, get government contracts, increase profitability and get access to the money they need to grow their businesses. The program is totally free to the participants but there are qualifications they must meet. They must have been in business for a minimum of 2 years, have annual revenues between $150,000 and $500,000, and be interested in growing. The next class will be selected in November of this year and start in January 2017. Businesses must be located in Duval, St. Johns, Nassau, Baker, Clay or Putnam Counties to participate. 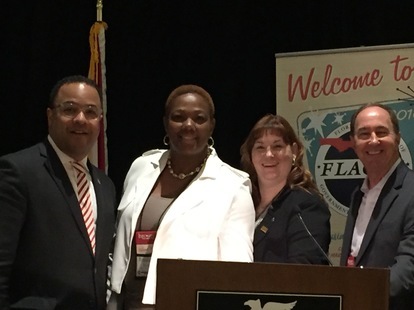 The North Florida District Office participated in the 2016 Florida Association of Government Guaranteed Lenders (FLAGGL) conference. Rosalind Bryant, Lender Relations Specialist provided the audience with updates and other information about North Florida. The office also resigned the Statewide Strategic Alliance Memorandum (SAM) along with the South Florida Office. Pictured: Cassius Butts, SBA Regional Administrator; Rosalind Bryant, North Florida District Lender Relations Specialist; Jonel Hein, Deputy District Director for the South Florida Office; and Rick Von Minden, FLAGGL Board President. New Strategic Alliance Memorandums Signed! The North Florida District Office (NFDO) recently signed a Strategic Alliance Memorandum (SAM) with the Orlando Chapter of the National Association of Women Business Owners (NAWBO). The groups will work together to increase training and other opportunities for women business owners. Donna Padgug, Women’s Business Specialist/Economic Development Specialist facilitated the signing with NAWBO –Orlando. 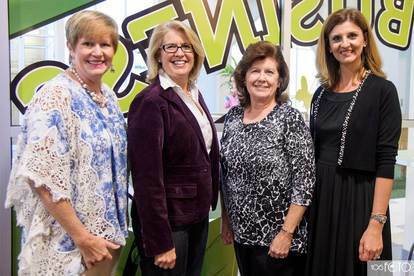 L to R: Pamela Rogan, Immediate Past President, NAWBO Orlando, Jennifer Dickerson, Community Partnership Chair, NAWBO Orlando, Donna Padgug, SBA North Florida Women’s Business Specialist, Lydia Chicles, President, NAWBO Orlando. Photo Courtesy of Nancy Jo Brown / 106FOTO . 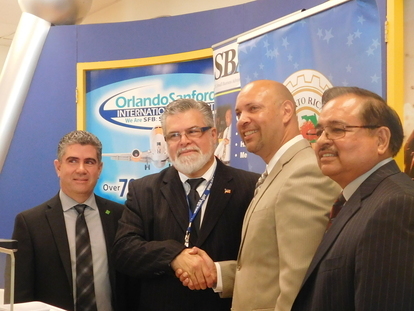 The NFDO also signed a statewide SAM on August 30 with the Puerto Rican Chamber of Commerce of Central Florida. The Chamber is expanding its reach into several Central Florida counties to serve the growing population of business owners from Puerto Rico. SBA will partner with the Chamber to bring training and workshops and other resources to the area. The event was hosted at Sanford Airport, where the airport also announced there will be new direct flights to Puerto Rico 4 times a week starting in December. Pictured: George Seda, Vice President, Puerto Rican Chamber of Commerce of Central Florida; Ed Ramos, SBA Senior Area Manager Orlando (North Florida); Amilcar Cordova, President, Puerto Rican Chamber of Commerce of Central Florida; and Robert Chavarria, Senior Area Manager Tampa (South Florida). Each year the federal government hosts a "Feds Feed Families" campaign and asks agencies to share collected goods with local food banks. 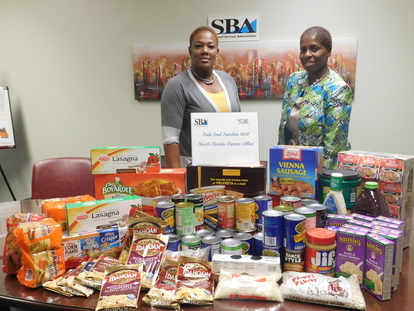 This year the SBA North Florida District Office collected 121.6 pounds of food and donated to Lutheran Social Services of Jacksonville. Rosalind Bryant, LRS and Natalie Hall, EDS served as the volunteer coordinators for the food drive. SCORE, is a nation-wide volunteer organization and an SBA resource partner that provides free counseling and advice to small businesses. SCORE Jacksonville is celebrating it's 50th anniversary by showcasing local companies that have been in business in Jacksonville for at least 50 years. SBA and SCORE invite you to come participate, and learn how these companies have survived and thrived over 50 years. More events sponsored through our resource partners are available on the District Website. Interested in starting or growing your business? The SBA offers free online training to help you get started. Visit our online learning portal! The federal fiscal year starts on October 1 and ends on September 30 every year. This year the SBA has helped thousands of small business owners start and grow their businesses, and provide the necessary resources for their success. We look forward to continue to provide quality support to the small business community in the upcoming year as well. If you are thinking about starting a business, contact our district office to see how we can help you!